The hosts of Fox & Friends mocked Illinois State University’s decision to accommodate LGBT students by designating certain campus restrooms as gender-neutral. 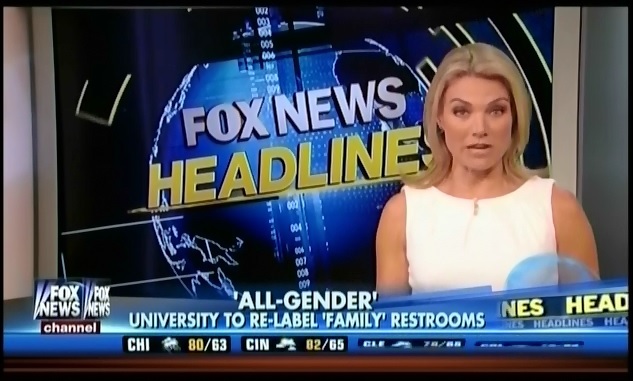 During the July 9 edition of Fox & Friends, Fox’s Heather Nauert reported on Illinois State University’s decision to re-label a number of single stall restrooms on campus, designating them “all-gender” restrooms rather than “family” restrooms. The change is expected to affect approximately 10 restrooms and won’t affect the functionality of any of the facilities. Designating gender-neutral restrooms on campus is a common practice aimed at accommodating growing populations of transgender and gender-variant students, who often face harassment and even violence in public restrooms. Fox & Friends has a habit of ridiculing gender-neutral accommodations as ridiculous or unnecessary. The show has mocked gender-neutral passports, passport applications, college housing policies, student financial aid forms, and marriage licenses. In all of these cases, the changes were minor adjustments made to acknowledge members of the LGBT community. And in all of these cases, Fox & Friends jumped at the opportunity to turn gender-neutral accommodations into an early morning punch lines.